There are several ways to enroll in Writers’ Program courses. First, select a course from the Extension website or catalog, then locate the Reg # for the course you are interested in. If you need help choosing the right course for you, Writers’ Program advisors are happy to help at (310) 825-9415. Call 1-800-825-9971 and press 1. Hours: Monday – Friday, 8:00 am – 5:00 pm, PST. Have your American Express, Discover, JCB, MasterCard or VISA number ready. 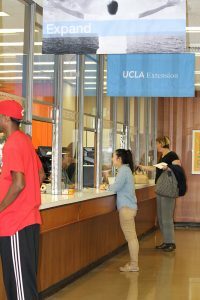 Enroll at the UCLA Extension Temporary Registration Office on the 1st floor at the Gayley Center at 1145 Gayley Ave. See a map here. Download our Enrollment Form and return with payment (check or money order only) to our address below.